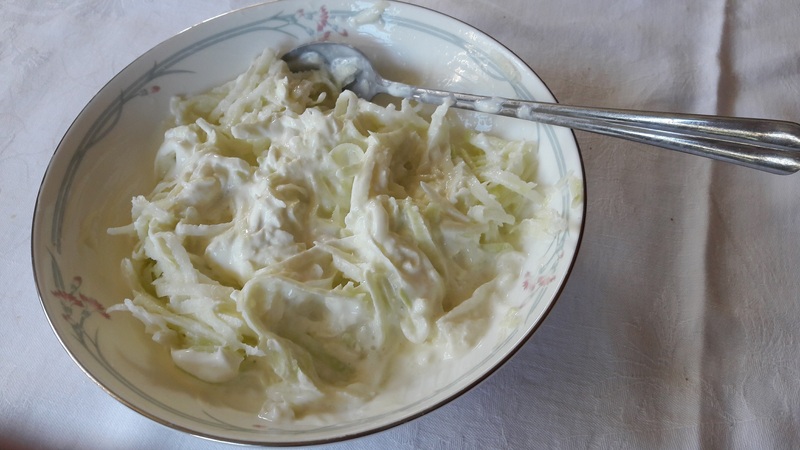 Kohlrabi in Polish is kalarepa – it belongs to the cabbage family – the Brassicas – and has been cultivated from Brassica oleracea – the wild cabbage. It is a swollen stem and spherical and its taste and texture is similar to cabbage heart and it can be eaten both raw & cooked. My auntie in Wembley used to grow kohlrabi in the garden & on their allotment but until recently I never saw it for sale in England whereas in Poland it is a common vegetable, it matures quickly, withstands the frost and can be stored for some time. This kohlrabi I bought from the outdoor market in Leeds. For all the salads below the raw kohlrabi has been peeled and then grated on a medium grater. Here I have just used 1 kohlrabi per salad. Served here in a Royal Doulton – Carnation dish – 1982 – 1998. Mix the soured cream with the lemon juice. Mix the grated kohlrabi with the dressing. Grated kohlrabi is mixed with a chopped eating apple – use an apple with a red or pink skin for the lovely colour – here I used a Pink Lady which has a super taste. Mix the natural Greek style full fat yoghurt and apple juice for the dressing. Served here in J & G Meakin – Topic by Alan Rogers, 1967. You can steam the kohlrabi – steam several whole ones and peel them once they are cooked and cooled. Use the steamed kohlrabi in place of steamed Celeriac in salads.